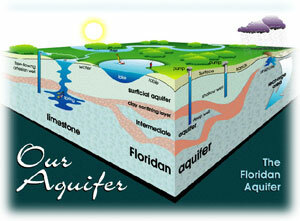 The Floridan Aquifer stores an abundance of pure water for the future use of Florida. The drilling depth varies across the state and usually runs between 900 and 1500 feet. There are five regulatory districts in Florida to manage the consumptive use of water, aquifer recharge, and well construction.